Nobody starts a vacation intending to become a trailer sway wreck statistic. However, you can prevent this type of accident by following some of these towing tips and proper set up procedures to ensure safe travels while on route to your destination. What Caused The Travel Trailer Sway Wreck? As these RVers in the video flipped their rig on the highway, look at the travel trailer carefully. Notice the fish tailing action? After the trailer flips, a casual glance suggests that maybe the tow vehicle was mismatched to the trailer. Improper match of tow vehicle and trailer is a major cause of trailer sway wrecks. There may have been many other factors that led up to this trailer accident, including uneven hitch weight distribution, excessive speed and wind. 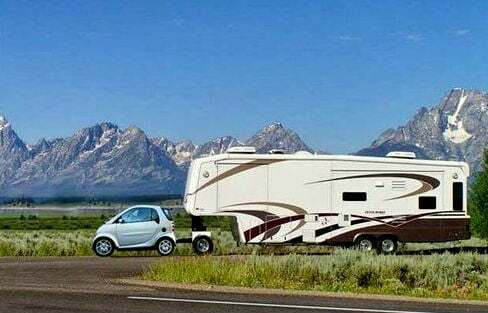 RVs are large vehicles. Surprisingly, they usually don’t require any kind of training or special license to operate. As RVers it’s up to us to learn the best ways to avoid trailer sway wrecks and other RV accidents on the highway. These four simple tips will help you be a safer RV owner on the road. Whether you’re looking to buy a travel trailer or you already own one, you must know if your tow vehicle and trailer is a good match. Locate the Gross Vehicle Weight Rating (GVWR) of your tow vehicle. This represents the maximum weight your tow vehicle can carry, including passengers, cargo, fuel and the vehicle itself. Find the Gross Trailer Weight (GTW) of the trailer you want to buy. Compare the two figures. If the GTW exceeds 50 percent of the GVWR, a trailer sway or even a wreck could happen. If your trailer weighs more than 50-percent of the tow vehicle’s weight, much of the towing burden will be forced onto the tow vehicle’s rear axle instead of front and rear. This also happens if your trailer has too much weight located behind the axles. Excessive weight on the rear axle will cause your headlights to point up, your rear end to sag and handling problems to occur. Eventually you could end up like the RVer in the trailer sway wreck video pictured above. A good weight distribution hitch system will set you back a couple hundred dollars, but it will spread trailer hitch weight evenly across all vehicle and trailer axles. Maintain a safe speed on descents. Downshift into lower gears to slow down. If sway occurs, manually use the trailer brake controller to slow down. Trying to brake with your tow vehicle usually makes the problem worse. If the trailer starts feeling unsteady, do not apply the brakes. Steer straight until you’re through the wind. Accidents happen but avoiding trailer sway and an accident is almost entirely up to the person behind the wheel. Preventive actions begin by safely matching up the tow vehicle to the trailer, continue with regular RV maintenance like proper tire inflation and always exercise safe, defensive driving techniques on the open road. Check the maximum towing weight rating of your tow vehicle. This should be more than the fully loaded (not empty) weight of the trailer you are planning on towing. If a salesman tries to tell you that you can tow heavier weights than this, as I have been told, leave immediately. A weight distributing hitch is a MUST for towing trailers weighing more than 3,000 lbs, which will transfer weight from the rear axle to the front axle, equalizing the weight distribution. If you are so foolish as to not use such a hitch weight will be taken from the front tires, reducing their ability to counter trailer sway forces. Anti-sway devices are also available. They range in cost from $50 to $3,000. The trailer will also have to have brakes (usually electric) and the tow vehicle a brake controller. This is required by law in most states. Trailer stability can be tested by doing a fast, or emergency, lane change on an appropriate road with no other traffic. Do the lane change at progressively higher speeds, up to the planned towing speed. If excessive sway begins stop the test and fix the problem. Remember, you may have to do this while actually driving, so this is not an unreasonable test. It will also help you decide what a safe top towing speed is. This is obviously a case of driver error, driving too fast for the conditions The truck is more than capable of handling that trailer. You can not tell how fast he was driving, but if you watch closely you can see several times what looks like freeboard wind push. He needed to slow down. I also suspect that the trailer was not loaded properly, not enough hitch weight. This is very common on 3 axle toy haulers. There was not a lot of sway shown in the video, what I saw was a huge gust of wind just take it over and the driver not being able to control it. I think that video is a poor selection for the article; that was not an example of typical trailer sway, but a roll-over accident caused, most likely, but very high gusting winds. A 50 mph crosswind gust will generate a 3,600 lbf load on a 35 ft trailer. Combine this with the rebound effect of the suspension and it is no surprise what caused this trailer to overturn. Note that an empty trailer is even more susceptible to this kind of accident because there is less downforce to counteract the horizontal wind force. Thanks for the feedback Thomas. If you have videos that show a better trailer sway wreck, let us know so we can all learn from them. Thanks again. Notice the tow vehicle is a dually. Conventional thinking is the tow vehicle needs to be larger to diminish trailer sway. Clearly, it isn’t the case. The primary source of controlling trailer sway is the location of the pivot point. I have been in the RV industry for 20 years and now manufacture the premier trailer sway eliminating hitch available in the market. PLEASE learn about pivot point projection if you’d like to prevent the problem in the video. This is completely untrue. By that standard, every large highway tractor-trailer rig could only tow 5 tons, not the 40 tons that they can actually tow. That dually pickup… less than half of its actual trailer weight rating. “Rules of thumb” can be useful quick starting points, but cannot replace intelligent and well-informed analysis. You are in fact correct that this is a rule of thumb and a guide only. However it is a recommended concept to adhere to and ensure certain hitch configurations are made to prevent accidents (with heavy trailers). But thanks for pointing this out. Excellent point, Brian. The pivot point location of a tractor-trailer combination does not allow the weight of the trailer to be leveraged against the tractor. It’s true that large highway rigs generally use fifth-wheel hitches (as do many RV trailers), and the location of the coupling point over the tug’s axle makes the tug much less sensitive to lateral force on the coupling, but that does not make them immune to sway. They’re still trailers, and an unstable trailer will still sway even when hitched to a perfectly stable tug. At the very least, the rule of thumb is only for “bumper” hitch configurations. Have you ever looked at a car transporter? They usually have the hitch behind the truck – not over the axles – and so tow just like any “bumper pull” trailer. Many gravel trucks tow trailers; they use pintle hitches rather than ball hitches, but the dunamic are the same. Trailers of both of these types weigh much more than half the loaded weight of the truck towing them. They are stable because stability is mostly a matter of mass distribution within the trailer, and key dimensions such as the distance from axle to ball… not the weight of the tug. Yes, but now you are getting into the fact sway is a multi-variable condition. Tests show that pivot point location is the single greatest factor, along with speed, to preventing uncontrolled oscillation of the towed trailer. Removing the lever arm created by the pivot point being located a distance behind the rear axle provides more stability than most RVers know is possible with a bumper pull trailer. However, ask any of them if a 5th wheel is a more stable tow and most will tell you yes. I agree that typical fifth-wheel rigs are more stable than typical “bumper-pull” rigs – that’s a major advantage of this RV design. It’s just not perfect, and conventional trailers are not inherently bad, because neither tow vehicle capacity nor coupling location entirely determine sway. Sean, I realize that you are promoting your Pro-Pride hitch, a variant of Hensley’s Arrow design – maybe you’re not allowed to say that in RV Life comments. How far ahead of the ball location (in the trailer’s coupler) is the virtual pivot point of the Pro-Pride? It’s a fundamental characteristic of the four-bar linkage on which this design is based. I’m not really promoting anything other than information people should know about towing. I didn’t mean for it to be a promotion. Just facts about stability that I know to be true through tens of thousands of examples and spending the last 20 years of my life doing it. It’s always better if people know the facts irrespective of any product. Thanks for the information, Sean. A semi has roughly half of the trailer (tongue) weight on the tow vehicle; with RVs it is more like 10%. If semi’s were setup like RVs you would not be able to tow it. RV fifth-wheel trailers have more typically 20% to 25% of the trailer’s weight on the hitch (not 10%), and multiple-trailer commercial rigs can have less than 1/4 of the trailer weight on the truck’s hitch… but the point is that a simplistic rule of thumb is not helpful. Even if limiting the discussion to only conventional (not fifth-wheel) trailers with 10% hitch weight, under the “50% of GVWR rule” large pickups would be limited to relatively small travel trailers, and no pickup could tow many of the travel trailers which are currently available. That’s just ridiculous. If you can afford there are Weight Distribution Hitches with sway control built-in. A couple of WDH’s that comes to mind is the Hensley & Propride Weight Distribution Hitches. Both hitches use the same type of sway control principal and similar design. When towing I first look at the automobile manufacture tow capacity rating then a tow vehicles GVWR. Some vehicle the manufacture’s tow capacity rating exceeds the tow vehicles GVWR. e.g. I remember a Jeep with a GVWR of 4900 lbs. with a maximum tow capacity rating of 5000 lbs,, more than 50 percent of the GVWR;. Sometimes use of a WDH (weight distribution hitch) comes into play, possibly a tow vehicle and/or hitch has a higher max. tow capacity when using a wdh. GVWR is something to consider when towing, however calculations using a tow vehicles GVWR isn’t necessarily a tow vehicles max. tow capacity. You should first try to find, discern the manufacture’s max. tow capacity rating for a specific vehicle as it came from the factory, which may or may not involve using a WDH. I’m having away problems with my fifth wheel. Does anyone know if the trailer should be riding level? I’ve been told that the trailer needs to be slightly nose heavy. Yes it should be level. If it can’t be quite level, and it has two axles, slightly nose-up is better than nose-down. But this has nothing to do with being nose-heavy. The manufacturer of the trailer should provide some guidance about how much of the trailer’s weight should be carried by the hitch, but whatever this weight is, the trailer can still be level (by adjusting the hitch and pin box as required). Fifth-wheel trailers are usually quite stable, because the hitch over the truck’s axle is good for stability, and because they usually have he centre of mass well ahead of the axles (which is why they have a high proportion of their load on the hitch). If your trailer is not stable, it probably has a lot of mass near the back end – or worse, hanging off the back in some sort of cargo carrier. If you have cargo on the rear, get rid of that (move it to the truck box, or further forward in the trailer), and you’ll probably see better stability. Another cause of poor stability in tandem axle trailers (trailers with two axles) is having the trailer nose-down, which causes the leading (front) axle to carry more load than the trailing (rear) axle. This is not good – more level (or slightly nose-up) will help.